I originally had a bottle of Telegraph's Robust Ale in line for a review. But I let it sit in the queue for a bit too long, and as far as I could tell it had spoiled once I finally got around to it. At least I hope it spoiled, because it was foul. 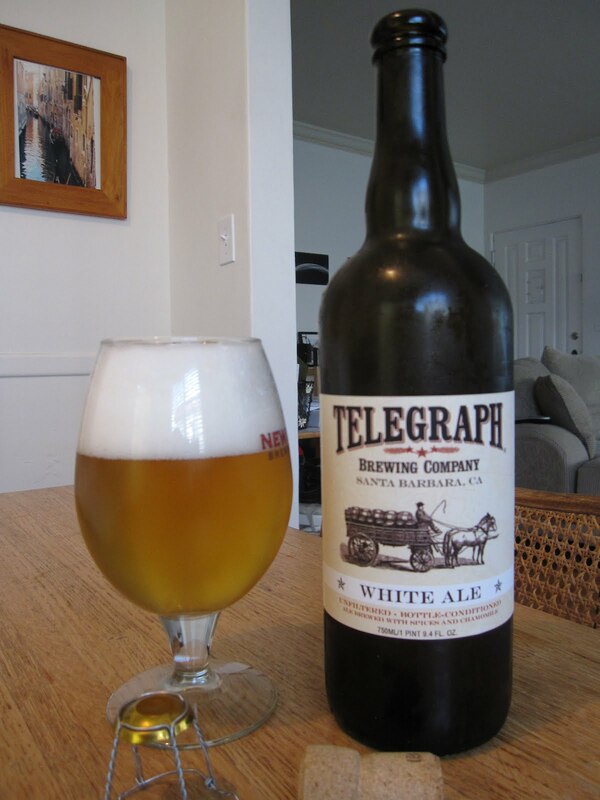 So I felt like I had to make it up to Telegraph (not that they care), and I picked this one up. It's brewed with orange peel, coriander, and chamomile. The bottle says this should be eaten with fresh farmer's market cuisine. Sorry, lads, but I'm going to hammer some pollo asado instead. The pour told me this is pretty highly carbonated, as it yielded a pretty thick head even with some gentle treatment. And it had a weird bubble vortex thing coming off the bottom of the glass for a good ten minutes after I poured it. The nose is nicely Belgiany, actually a lot like Horny Devil, but with a notable orange note (which makes sense) and a bit more pilsnery skunk. The flavor's very nice, light and refreshing, and it's got a really light body that's buoyed by a nice tartness. The coriander and orange peel are there, the latter more than the former, though both are lighter than I'd expected. I'm not aware of any chamomile, but I don't wander around grazing on chamomile flowers and I don't really like tea so I don't know what it's supposed to taste like. There isn't anything floral that I can pick up, though. It's well-balanced and easy to drink, while at the same time having good flavor. All in all, it's a nice expression of a white ale. I'm not sure they achieved the level of complexity they were aiming for, but that doesn't mean it's bad. I feel kind of bad about this one. Because, like I said, I like the flavor, and it's a pretty good version of a white ale. But as I drink it, I find myself wishing it was Horny Devil- it's got a lot of the same flavors, but HD just has everything amplified, including the ABV. I know that's completely unfair to Telegraph, especially given that this isn't supposed to be a strong ale, but that's where I am with it.